A five-year-old battle between two designers' Hawaiian plumeria jewelry rages on, as an appeal to a "trade dress infringement" suit heads to the 9th Circuit Court of Appeals in San Francisco. At stake is $2.3 million plus attorneys' fees awarded to the plaintiff by a judge last year, plus a permanent injunction. Also, the egos of two dueling artists. Can one jeweler be sued for imitating another's gold plumeria jewelry, even if the two pieces don't look exactly alike? 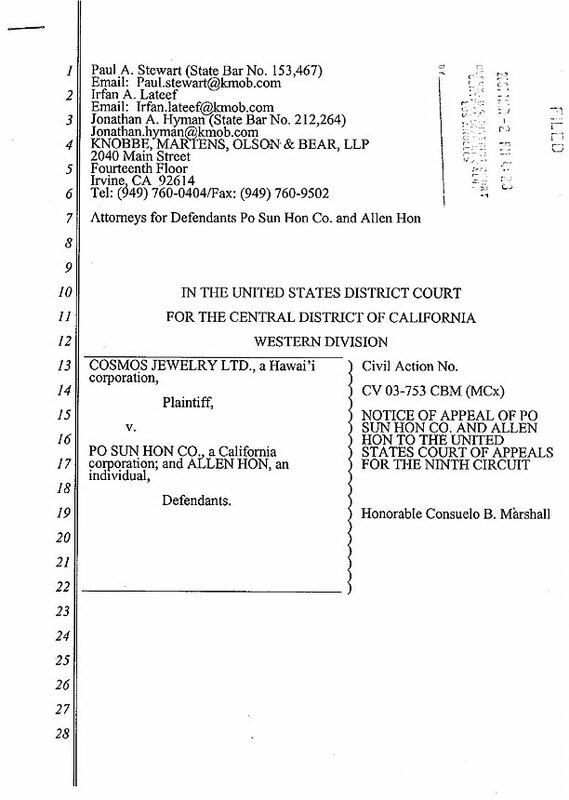 In a precedent-setting case, Honolulu-based Cosmos Jewelry won a suit against Los Angeles-based Po Sun Hon Co. last year for trade dress infringement of the Cosmos plumeria lei collection. But the battle between the two designers continues, as an appeal heads to the 9th Circuit Court of Appeals in San Francisco. Cosmos' Denny Wong says Allen Hon was imitating him, and flooding the market with a cheaper version of his plumeria line. Hon says he designed his own version of plumeria jewelry, based on an independent study of the five-petaled blooms. Jewelers in Hawaii, meanwhile, say the plumeria is a hot-selling item -- and that they all have their own versions. » Jan. 31, 2003 Cosmos files complaint against Allen Hon of Po Sun Hon Co. alleging copyright infringement, trade dress infringement and unfair competition. » Aug. 24, 2006 Judge Consuelo B. Marshall rules out copyright infringe- ment, but in favor of trade dress infringement and unfair competition. She awards Cosmos Jewelry $2.3 million. » Sept. 21, 2006 Po Sun Hon's attorney files notice of appeal. » May 2007 Po Sun Hon's brief due. » June 2007 Cosmos' brief due. » Fall 2007 Possible decision on the appeal. The plaintiff: Denny Wong of Cosmos Jewelry Ltd., an award-winning local jeweler who's been designing gold plumeria jewelry since 1993. Wong has had a copyright on his "Tropical Memory Collection -- Plumeria Lei Series" since 1997. 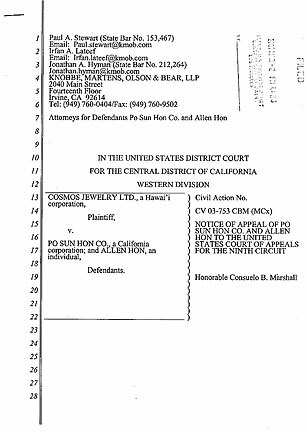 The defendant: Allen Hon of Po Sun Hon Co. in southern California, which began selling a line of yellow gold plumeria jewelry in 2000. He, too, took out a copyright for the "Allen Hon Design Collection -- Plumeria Flower Jewelry" in 2002. Wong alleged that Po Sun Hon Co. was copying him, flooding the market with a cheaper version of his plumeria line, and that Hon had even threatened to do so in a personal encounter. U.S. District Judge Consuelo B. Marshall last year ruled out copyright infringement, but sided with Wong over trade dress infringement and unfair competition. Even though the two designs were not similar, the court said Hon's pieces would likely create consumer confusion. The court even went so far as to say in its findings of fact: "The Cosmos blossom is visibly of a much higher quality." 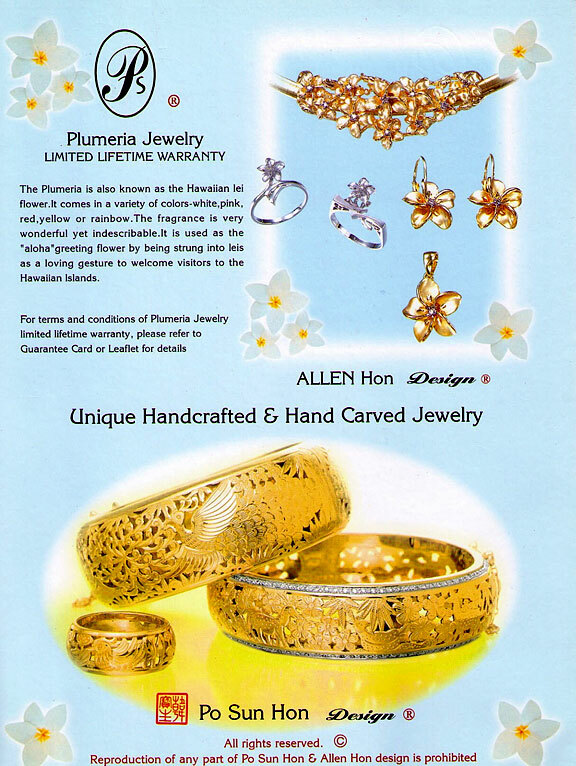 In August of last year, Hon stopped selling or manufacturing yellow gold plumeria jewelry. In the fashion industry, trade dress is fast becoming the claim of choice by designers fighting knockoffs of their creations. Trade dress refers generally to the image and design of a product, which could include its size, shape, color, texture or graphics. It includes the distinctive shape of a Coca-Cola bottle, for instance, the particular style of a Levi's back jean pocket, and the outline of a Shelby Coupe. Though he lost the first round, Hon is not giving up the fight. He's hired a new attorney, Paul Stewart of Knobbe, Martens, Olson & Bear LLP to file the appeal. Stewart replaces John Yates of Berman Mausner & Resser, which represented Po Sun Hon in the trial. Stewart said he found the trial judge's decision surprising, since she ruled out copyright infringement. He is also disputing the $2.3 million amount of the claim, which he said included invoices from all of Po Sun Hon's sales receipts, and not just sales of his plumeria jewelry. Wong is still represented by Rod Berman of Jeffer, Mangels Butler & Marmaro LLP. Berman told the Star-Bulletin that while he's pleased with the judge's ruling on the trade dress infringement, he's considering an appeal of his own -- of the ruling on copyright infringement. "This particular jewelry of Denny Wong is very well known," he said. 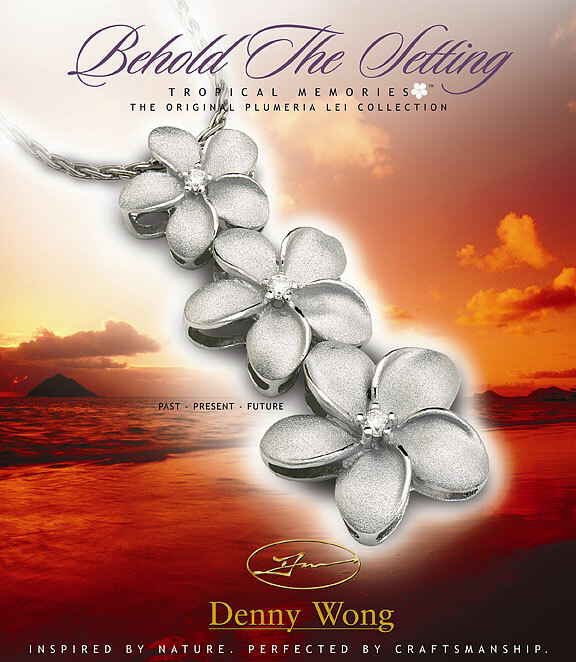 "At trial, witnesses testified that consumers would ask for the Denny Wong jewelry, and they were able to recognize his particular version of the plumeria." The duel between the two jewelers, both hailing from Hong Kong, has become personal as well as professional. The pair had a heated exchange at a Kauai jewelry store, in which Wong accused Hon of copying him. Hon is said to have urged Wong not to sue him because his designs were fundamentally different and because "the two were both Chinese," according to court documents. Hon, who lives in Los Angeles but sells mostly in Hawaii, said he created his line of plumeria jewelry after studying photos of the five-petaled flowers. "The fact is he did not copy," said Andy Ninh, an interpreter for Hon. "He's a businessman, but mostly an artist. To be accused of copying is something he can't accept... He's a much more creative designer." Ninh said Hon would continue to battle the lawsuit every step of the way. Plumeria jewelry is a hot item, according to retailers, both among locals and visitors. Stores typically sell plumeria pieces as "Hawaiian-style" jewelry, though the flowers actually are not indigenous to the state. "Plumerias have been very popular for many years," said Bob Taylor, president and CEO of Maui Divers Jewelry, which manufactures its own line of plumeria jewelry. But Taylor says he hasn't taken out a copyright for it because it's too common. Rick Schmidt, store manager of Na Hoku at Ala Moana Center, said the company has long had its own line of plumeria jewelry but no copyright to his knowledge. Its signature piece is an 18-karat plumeria necklace with platinum and diamonds. The store also features floating plumeria silhouettes, some of which are set with diamonds or inlaid with mother of pearl. Stewart said he's ready to present case histories that illustrate one can't claim trade dress for items from nature. Also, there are plenty of plumeria pieces sold throughout the industry, he noted. "One of the issues we're raising is the fact that there are so many other plumeria jewelry pieces out there," said Stewart. "The use of plumeria design in your jewelry cannot set you apart and distinguish you as the supplier of the jewelry." A ruling by the court of appeals likely won't happen until some time after this fall.